Welcome to Apple Ridge Montessori! students between the ages of two and a half and six. and George Clooney (Academy award-winning actor). present and the future of your child. The staff consists in a Montessori Trained teacher and a certified aide. 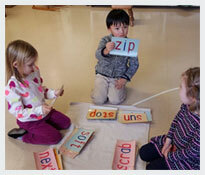 Our program includes many practical life exercises that develop order, concentration, coordination, and independence. 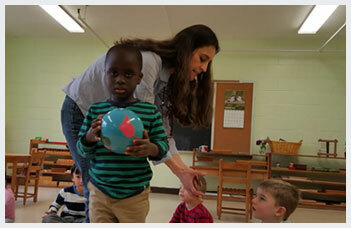 Apple Ridge Montessori School admits students of any race, color, or ethnic origin to all the rights, privileges, programs, and activities of the school. 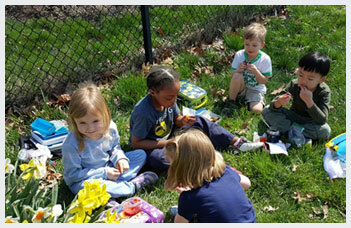 Montessori principles and goals are integrated into the whole day at Apple Ridge. The resulting consistency provides the children with the security and confidence they need to adapt to their daily routine. The children are constantly observed and supported in their exploration of learning. 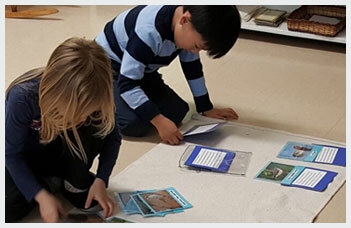 Montessori principles and goals are integrated into the whole day at Apple Ridge. The resulting consistency provides the children with the security and confidence they need to adapt to their daily routine. Apple Ridge Montessori School is in session five days a week and offers both half days, from 8:30 until noon, and full days, from 8:30 until 3:00.